Domiciled in a stately 1877 townhouse just a few steps from the Kimmel Center, Russet inhabits the comfy converted space that was once home to Ernesto’s 1521 Café, a restaurant I was fortunate enough to visit (and thoroughly enjoy) on several occasions. 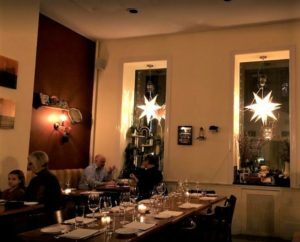 But whereas Ernesto’s spoke with a decidedly Italian culinary accent, Russet’s emphasis is clearly farm-to-table, its daily-changing menu shaped by the best produce, dairy products, grains, and whole animals that local farmers have to offer. 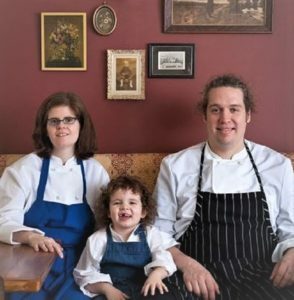 Chef-proprietors Andrew and Kristin Wood are totally dedicated to the approximately 250 individual small farms with which they deal directly. In turn, their patrons are served the freshest and high-quality ingredients available. There is absolutely no question that the farm-to-table concept is driven by noble intentions. That being said, however… in order to arrive at table in a semi-ingestible state, all those fresh, high-quality, straight-from-the-farm constituents must pass through a kitchen. And there’s the rub. In the hands of a fifth-rate chef and/or his misbegotten minions, even the finest of ingredients could easily be transformed into a mass of pottage a ravening hyena wouldn’t deign to sniff at. Superlative quality is no guarantee of superior – or even mediocre – preparation and presentation. At Russet, fortunately, there are no worries on that score, as all of Mr. Wood’s offerings have been pretty much spot-on. Menu-wise there are a lot of interesting things going on… Mr. Wood is constantly shuffling ingredients around, adding a subtle seasoning nuance here and there, or simply offering the same item in a totally different light. On one occasion, for example, the Arctic Char will be presented as a grilled entrée embellished with cheddar cauliflower, shaved kohlrabi, haricots verts, and salsa verde; on another, it will put in a guest appearance as a gravlax appetizer adorned with marinated heirloom tomatoes, grilled focaccia, and ricotta cheese. Among the appetizers, pastas are a big draw; and there are several – with a continually changing inventory of ingredients – that appear to be menu mainstays. Of special interest is the Spaghetti alla Chitarra. This is a variety of egg pasta typical of Abruzzo, Italy. The name comes from the tool (the chitarra, literally “guitar”) with which the pasta is produced, a frame with a series of parallel wires (pictured). 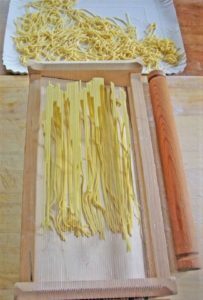 The dough is rolled flat, placed on the chitarra, and then pushed through with a rolling pin, the strings of the “guitar” cutting it into spaghetti-like strips. The most recent variation on the theme included little neck clams, chanterelle mushrooms, corn, cutting celery (curly-leafed celery that is used as a garnish/flavor enhancer), lemon, and chives. 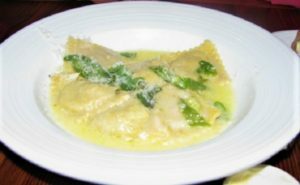 Ravioli is another extremely popular pasta resident… And, once again, the ingredients may change daily. Recently sampled, for example, was the Charred Eggplant Ravioli, which, while rather short on eggplant, was long on other pleasing attributes. The tiara of sautéed shishito peppers not only added a splash of vibrant green color, but also a lively sweet and smoky flavor. Roasted garlic, ricotta, and Parmigiano-Reggiano were other major contributors, along with a sprinkling of nepitella. Also known as calaminta, nepitella is an herb that grows wild in Italy, particularly in Tuscany and Umbria. The green leaves’ strong and distinctive flavor, best described as a cross between mint and oregano, added a delightfully distinctive touch to the presentation. The Grilled Local Peach Salad is another highly recommendable starter. The fruit is supplemented by a delicate variety of summer lettuces, thinly sliced cucumbers, toasted almonds, and scintillatingly savory pickled red onions. It’s the dressing, however, that makes the salad; and Mr. Wood, as always, adds his own unique and memorable touches. He has a thing for coriander (dried cilantro), which has a highly unusual (some would say peculiar) taste – the Huffington Post refers to it as the “polarizing herb”; you either love it or hate it – but he uses its warm, spicy flavor to best advantage but teaming it up with a touch of honey in an intriguingly sensual concoction. If the Coriander Honey Vinaigrette is listed anywhere on the menu, you owe it to yourself to give it a try. 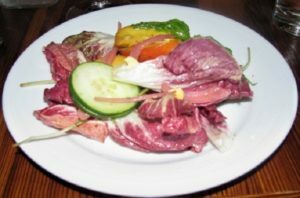 As you move on, the five entrées – depending upon the availability of local and seasonal ingredients – usually note at least one representative each of meat, fish and/or fowl. However, vegetarians may breathe easy, as the main courses always list a vegetarian option. In one instance, it was Grilled Italian Eggplant with roasted tomatoes, grilled long hot peppers, basil, and aged balsamic; in another, Stuffed Red Peppers with charred eggplant, toasted farro, tomato butter, dandelion, and Shellbark sharp goat cheese. When it comes to matters piscatorial, the Barnegat Light Scallops are a favorite here… ditto my dining partner’s choice of Cape May Fluke (pictured). The fish itself is firm of texture but superbly moist; and it is set on a seabed of zucchini fritters, patty pan squash, and grilled red onions… a luscious combo of colors, tastes, and textures. The pièce de résistance, however, is a judiciously artistic smear of sauce gribiche. This is a mayonnaise-style cold egg sauce that is made by emulsifying hard-boiled egg yolks and mustard with olive oil and a splash of vinegar. It is usually finished with finely chopped pickled cucumbers, capers, parsley, chervil and tarragon. Since fluke/flounder is a mild (slightly bland) tasting fish, the sauce gribiche succeeds in spicing things up considerably. My Lancaster Chicken Ballotine probably doesn’t sound nearly as interesting… but it was also quite good. 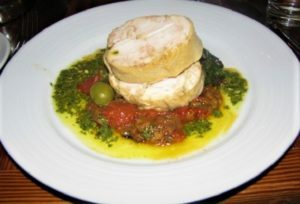 Ballotine – from French balle, a package – is a boned part of the chicken or other poultry stuffed with forcemeat and other ingredients. It is then tied to hold its shape and cooked by roasting, braising, or poaching. The representative here was rather on the bland side… but the zippy combo of olive, eggplant caponata, rainbow chard, plum tomatoes, and salsa verde more than compensated for this minor deficiency. All in all, a very enjoyable presentation. Desserts, like Russet’s other offerings, change daily based upon the availability of local and seasonal ingredients. Recently sampled, for instance, was the restaurant’s delicious homemade Peppermint Chocolate Chip Ice Cream adorned with a rich Valrhona fudge sauce. 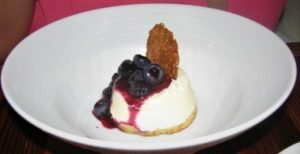 The table favorite, however, proved to be the Shellbark Sharp Chèvre Cheesecake (pictured). Set on a brown sugar blondie crust, topped with blueberry compote, and crowned with an oat crisp, the various elements work exceeding well together. The richness of the blueberry compote is the perfect foil for the sharp tanginess of the goat cheese, while the crust and oak crisp provide a marvelously provocative textural contrast. 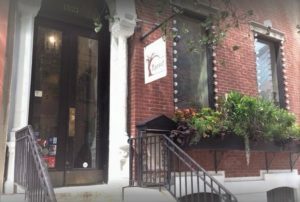 You will find the service here extremely pleasant & knowledgeable, the prices – especially considering the fact that you are dining in Center City – quite reasonable and, as an added bonus, Russet is BYOB… which will save you a ton of buckaroos. If you’re attending an event at the Kimmel Center, or just happen to be shopping or visiting in the area, be sure to pay a call, as this is a restaurant I highly recommend. Russet is open for dinner Tuesday – Sunday from 5:30 p.m.; brunch is served on Saturday 11:00 a.m. – 2:00 p.m. and Sunday 11:00 a.m. – 3:00 p.m.